10 High Street in Boston’s Financial District is home to a new eatery, Serafina. Fresh, modern Italian cooking. 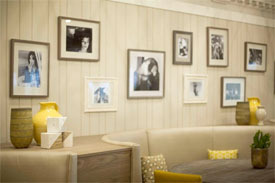 Some 30 black-and-white stills from Federico Fellini films, placed throughout the Financial District Italian restaurant. Restaurant designer Petra Hausberger of Brookline’s Somerton Park Interiors wanted to festoon Serafina with shots from Fellini movies like “La Dolce Vita” and “8½” because they would “engulf the space in fantasy and glamour.” Helpfully, a close friend is an archivist at the Academy of Motion Picture Arts and Sciences in LA. Hausberger was sent digital copies of the stills, many of which feature actress Anita Ekberg.